On arrival in Sri Lanka you will be met and assisted by our Airport Representative, who will direct you to your very own chauffeur who will transfer you into Colombo. Afternoon you can drive through the commercial and city centre known as the "Fort", built by the Portuguese in the 16th century where grand colonial era buildings stand alongside modern office structures. See the vibrant markets and bazaars of Pettah, and the National Museum with its fine collection of lovely antiques and art of Sri Lanka. You could visit a Buddhist temple and a Hindu Kovil to experience the diversity of religion, ethnicity and customs of the people. Alternatively you may indulge in some shopping and sightseeing or take a long walk down the golden stretch of Galle Face, which is populated with interesting food stalls and intriguing vendors. Pinnawala Elephant Orphanage - This orphanage was set up by the government to take care of baby Elephants, lost or abandoned in the wild. Witness the feeding of the elephants. Thereafter observe them as they take their daily bath in the river nearby, which affords marvellous photo opportunities. Bath time is enjoyed by all elephants, young and old alike and it is a good time to closely observe their tightly knit family structure. En route you will visit a spice garden in Mawanella. You will check in at your hotel on arrival and once you are rested, continue on to your tour of Kandy! Kandy, the bustling hill country capital is now a UNESCO World Heritage Site. It is famous for the Temple of the Tooth, which houses the most sacred religious relic, the tooth of the Lord Buddha, the Kandy Lake built in 1807, which is an attractive centrepiece to the town. Other attractions in Kandy include Peradeniya Botanical Gardens, Tea Museum, Royal Palace Kandy and many more. Rise early morning and leave for Knuckles Forest Range with a packed breakfast. This mountain range offers a wonderful place for Bird watching, Mountain biking, Hiking, Trekking, Wildlife Photography, and Camping. It also holds great fascination for geologists and naturalists. The Knuckles range derives its name from the similarity of its ridges to the knuckles of a clenched fist. It is a cradle for plant and animal life and is an invaluable asset where biodiversity and watershed values are concerned. After this exhilarating trek in the forest, return to Kandy. After breakfast, leave for Nuwara Eliya En route visit the Peradeniya Botanical Gardens where a rare collection of tropical exotic and indigenous flora including the famous Orchid House could be viewed. The total amount of species of plants are approx. 4000 this includes medicinal plants, and palm trees as well. After an early breakfast, leave for Horton plains, the highest plateau in the country. It is one of the very important National parks in Sri Lanka especially for its topographical variations. It has unique vegetation and is famous for many rare and endemic highland birds. The most awesome physical feature of the Horton Plains is the escarpment that falls 880 meters to the lowlands of the southern region of the island. Aptly known as the 'World’s End' the view from the precipice of the countryside below towards the south coast is spectacular. The climate is very cold in this area. Return to Nuwara Eliya upon completion. After lunch and at your convenience commence a sightseeing tour of the city. Visit the Nuwara Eliya Town, Market place, Golf Course, (one of the finest 18 holes Golf courses in Asia) the Hill club, and drive around this hill station viewing Lake Gregory. 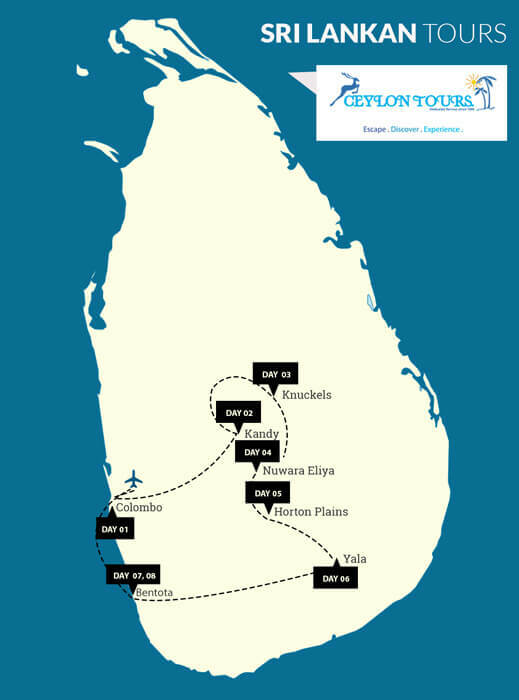 After breakfast depart for Bentota, delightfully located along one of the finest beaches on the South West coast. Spend the afternoon at leisure watching the waves as they bounce off the sun-kissed sands. Blissfully spend your time as you wish whether it be indulging in fine spa treatment or relaxing by the beautiful Indian Ocean.